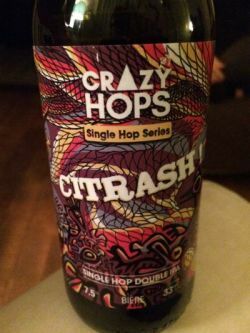 Crazy Hops Single Hop Series Citrash! Single hop Citra IPA. Ingrédients : eau, malt d'orge, houblon Citra (18g/L), levure. Sunday, June 9, 2018. Bottle, 33cL. 7.5%. Purchase ("La Cervoiserie", @Poitiers (86), FR). Home. A sparkling amber beer with a big off-white foamy head ; good retention and lacing. Herb, light resin, peppery mint (+), fruits (citrus : grapefruit, orange), light roasted cereal. Medium to sharp dry bitter, light to medium spicy, light sweet, warming background. Good body, oily texture, soft gaseous, fruity bitter dry lasting finish. Overall, enjoyable, good ! Imperial IPA au Citra.très bonne! On ressent bien le houblon, bel équilibre mais faut aimer le houblon cru très frais ! très sympa! Bottle shared. Slight hazy amber with good sized fluffy off white head. Some caramel, sweet malts, blueberries, dank marijuana, lime, some alcohol, marzipan, bready, blackberries. Lots of berries and dank hops, but the malts are not overpowered at all. Quite sweet and medium bitter. Almost full bodied. A bit alcoholic and malty but decent enough for an imperial IPA.